[Episcopal News Service – Honolulu] When the Rev. 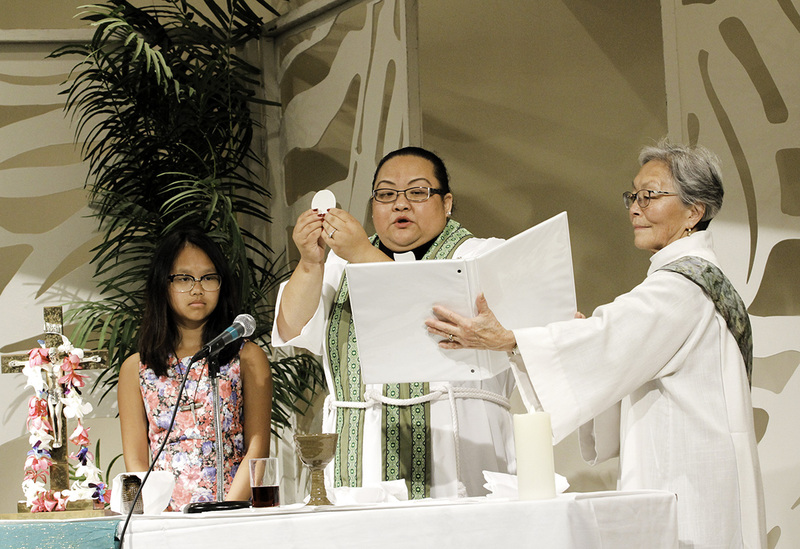 Bao Moua, the first Hmong woman ordained in the Episcopal Church, presided over the closing Eucharist at the triennial Episcopal Asiamerica Ministries National Consultation, it was a big deal. “One of my motivations is to encourage young women to go into ministry,” Moua said following the service in an interview with Episcopal News Service. Throughout the EAM consultation, women occupied larger leadership roles, both serving behind the altar and moderating the three panel discussions and leading workshops. It’s not easy to find Asian women priests, said the Rev. Yein Esther Kim, parish associate at St. Athanasius Episcopal Church in Los Angeles, who despite coming from a family of priests – her father is the Most Rev. 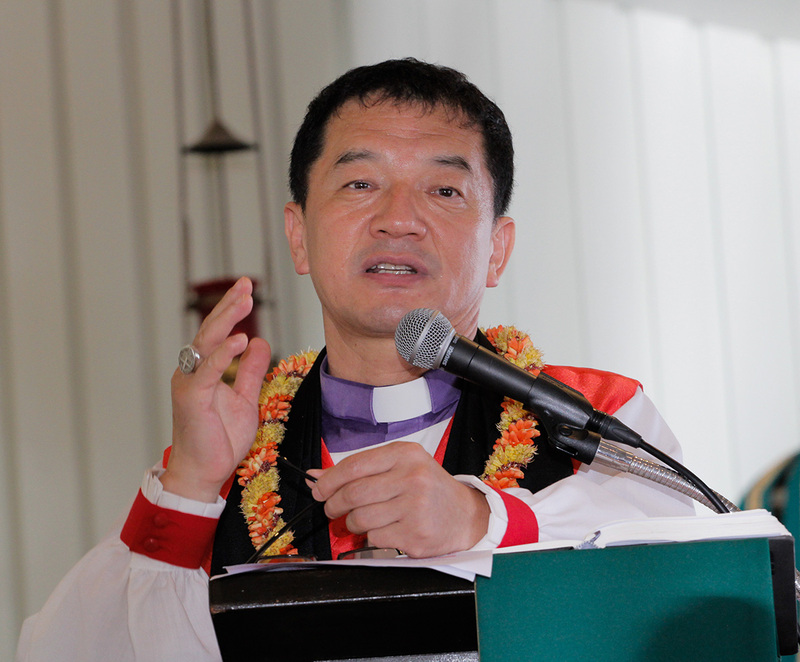 Paul Geun-Sang Kim, Anglican bishop of the Diocese of Seoul, and former archbishop of the Province of Korea – didn’t always see herself as a priest. She was inspired in 2001 when South Korea began ordaining women and by the examples of the Rt. Rev. Barbara Harris, an African-American priest who was elected the first woman bishop in the Anglican Communion, and the Rt. Rev. Diane Jardine Bruce, bishop suffragan in the Diocese of Los Angeles. 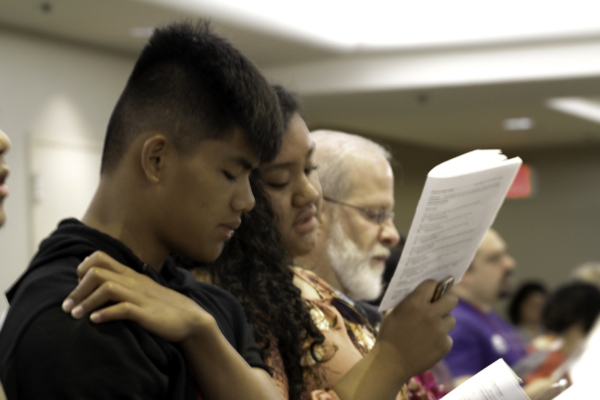 Registration for the Sept. 27-Oct. 1 consultation held at the Ala Moana Hotel topped 267 participants representing Asians from the United States, Canada, England, South Korea and the Philippines and including 40 American and Canadian teenagers. “We assembled a cast of great plenary speakers and workshop leaders. We wove the tapestry of a program that combined academic and experiential learning,” said the Rev. Winfred Vergara, the Episcopal Church’s Asiamerica missioner and the consultation’s co-dean, during the Oct. 1 closing Eucharist. There are some 22 million Asians in the United States, and Asians are its fastest-growing racial group. California has the largest Asian population, 6.8 million; in Hawaii, Asians are the majority at 57.1 percent, according to the most recent U.S. Census data. Seven consultations make up the Episcopal Asiamerica Ministries Council: Chinese, Japanese, Filipino, Korean, South Asian, Southeast Asian and Pacific Islander. 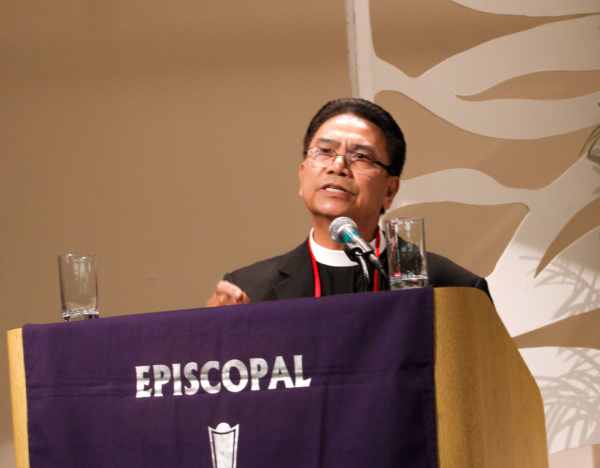 The council operates in partnership with the Episcopal Church’s Office of Asiamerica Ministries. Asian American or “Asiamerican” describes Asian immigrants in the United States as well as Asian Americans born in the United States – Chinese, Filipino, Korean, Japanese, Southeast Asian (Vietnamese, Laotian, Hmong, Burmese), and South Asian (Indian, Pakistani, Bangladeshi, Sri Lankan). It also describes the relationship of Asians in the United States with Asian Episcopalians and Asian Anglicans in the global community. Close to two-thirds of the world population identifies as Asian. The strong youth presence made the consultation one of the best ever, said Bayani Rico, EAM Council president and the consultation’s co-dean. The younger generation speaks to “the pan-Asian experience,” and EAM may add an additional convocation for those Asians who don’t identify with a single ethnicity. The Episcopal-Asiamerican church is an immigrant church that in reality speaks one language, said Yunjeong Seol, EAM’s digital media consultant. Oftentimes, the second and third generations don’t “speak the language of the mother country” and wonder how they can serve Asian-American ministries. And, realistically, she said, “bilingual services are hard to maintain.” Seol, who was born in South Korea and earned a Master of Divinity from Episcopal Divinity School, also favors adding a broader convocation. For Asupa Mila, 15, of San Francisco and Lake Randall, 15, of Vancouver, British Columbia, identity doesn’t really matter so much, they said. What they found in serving alongside one another in service to the community made them come together as friends. Asian identity is something Asiamerican Episcopalians are grappling with on both the east and west coasts. In New York, the Episcopal Asian Supper Table, EAST, invites all people of Asian ancestry to come together, to build “a united community by sharing stories, developing spiritually, and lifting up our membership as leaders in the Episcopal Diocese of New York,” according to the diocese’s website. In the Diocese of Los Angeles, the Asian ministries group is called the Gathering. Nationally, there’s a push among the EAM leadership to train new leaders in evangelism, church planting and church revitalization. To that end, during the consultation’s opening Eucharist held at the Cathedral Church of St. Andrew, the EAM network introduced the ANDREWS program and its first group of 70 mentors. ANDREWS’ goal is to develop a network of well-trained mentors and disciple-makers from among the EAM ethnic convocations. “Rice and Sing,” an anthology of diverse, Asian-cultural hymns and spiritual songs, is in development, as are in-person training and a virtual classroom. EAM convocations will meet separately in 2019 and come together again as a national consultation in 2021. The consultation last met in Seoul, South Korea, in 2015. – Lynette Wilson is a reporter and managing editor of Episcopal News Service.